In Java, an Is-A relationship depends on inheritance. Further inheritance is of two types, class inheritance and interface inheritance. It is used for code reusability in Java. For example, a Potato is a vegetable, a Bus is a vehicle, a Bulb is an electronic device and so on. One of the properties of inheritance is that inheritance is unidirectional in nature. Like we can say that a house is a building. But not all buildings are houses. We can easily determine an Is-A relationship in Java. When there is an extends or implement keyword in the class declaration in Java, then the specific class is said to be following the Is-A relationship. In Java, a Has-A relationship is also known as composition. It is also used for code reusability in Java. In Java, a Has-A relationship simply means that an instance of one class has a reference to an instance of another class or an other instance of the same class. For example, a car has an engine, a dog has a tail and so on. In Java, there is no such keyword that implements a Has-A relationship. But we mostly use new keywords to implement a Has-A relationship in Java. In the code above the Bike class has a few instance variables and methods. Pulsar is a type of bike that extends the Bike class that shows that Pulsar is a Bike. Pulsar also uses an Engine's method, stop, using composition. So it shows that a Pulsar has an Engine. The Engine class has the two methods start( ) and stop( ) that are used by the Pulsar class. In the code above we make an object of the Pulsar class and then initialize it. 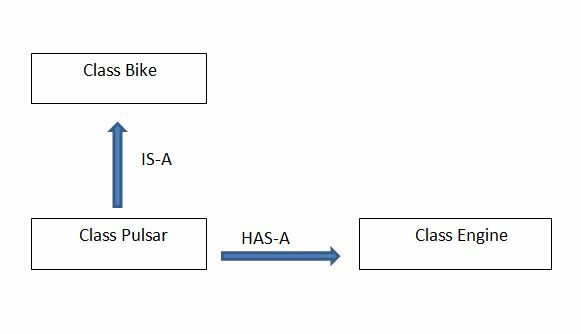 All the methods like setColor( ), bikeInfo( ), setMaxSpeed( ) are used here because of the Is-A relationship of the Pulsar class with the Bike class.